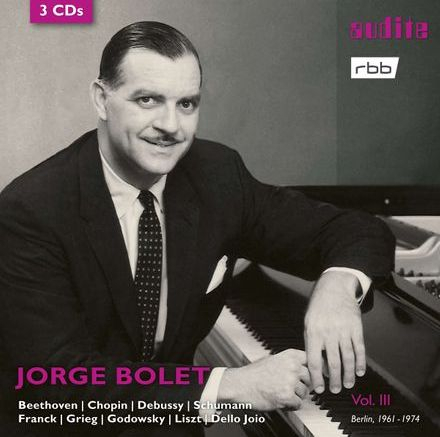 Born in Havana in 1914, Jorge Bolet studied at the Curtis Institute, Philadelphia from the age of 12, then had a long career that only really brought him wide and lasting international fame from the early 1970s. He specialised in the great Romantic composers, above all Liszt, but he also adored the rare and hidden gems of the repertoire - and the more outrageous the technical demands, so much the better. Yet he was never one to show off merely for its own sake; he was, above all, a musician. 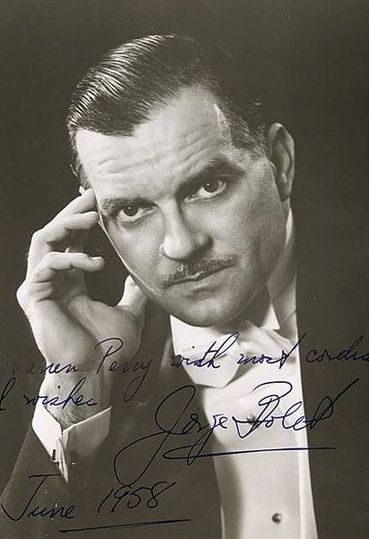 Though a native Spanish speaker, Jorge Bolet used an English pronunciation of his name:George Bo-LET (with stress falling on the final syllable). Jorge may not have been the greatest pianist, but he was always my favourite pianist. Apart from your today unrivalled virtuosity, there is the rarest of poetic elegance in the true Romantic style... It lives again in your unique combination of demonic daring, elfin delicacy and soaring lyricism. "His Rudolph Valentino physique heralded an intensely seductive relationship with the world, with a touch of chic like the fruit atop the frosty triangles of glasses holding exotic cocktails: blue lagoons and green ti' punches... I wanted to come face to face with a master: I recognised him as such." "He achieves (in my untutored opinion) the crucial balance between rippling and thundering virtuosity and a mastery of the sonority and complex harmonies of that great genius [Liszt] ...I cannot imagine living without him." JB in St. John's Smith Square, London 1987 in Kreisler/Rachmaninov. He is on superb form, clearly energised by the audience. A much loved performance ever since I first heard it on the radio that summer. Desert Island Discs is one of the longest-running radio programmes in the world. It holds the record for the longest-running factual programme in the history of radio. Originally devised and presented by Roy Plomley, each week a guest ("castaway") is asked to choose eight pieces of music, a book and a luxury item for their imaginary stay on the island, while discussing their lives and the reasons for their choices. The programme's theme is "By the Sleepy Lagoon" composed by Eric Coates in 1930. Near the top of any ‘favourites’ list must come the Schumann-Liszt transcription of the song Widmung. The performance reflects to perfection JB's soulful, songful genius. Christopher Daly, Villanova University, PA, for friendship and for lively discussions about pianists over many years. Alex Newton & James Hunter for helping me set up a website. Lesbia Orta Varona, Cuban Heritage Collection, Coral Gables, Florida. Frank Bell (Atlanta, Georgia). Monica Pasquale, great-niece of JB, David & Jorge Sierra-Bolet, Samuel Bolet, his nephews. Houston A. ['Tex'] Cummings, Donald Manildi, (International Piano Archive, Univ of Maryland, College Park), The British Library, The Free Library of Philadelphia. Susannah Thurlow, (Archivist, Curtis Institute, Philadelphia). Larry Yungk, Francisco Renno, Francis Crociata, Gregor Benko, Michael Glover. The 100th anniversary of Bolet's birth was marked in December 2014 by the issue of 6 CDs by Marston Records (Pennsylvania). 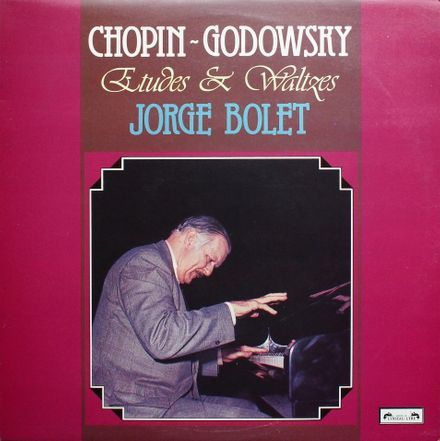 The recordings consist of much rare material, including material not in Bolet's discography. More information on MARSTON. This is the most important development in this pianist's legacy for some considerable time. Includes: Rigoletto paraphrase (3 October 1970, NYC), Chopin-Godowsky etudes (1976 Amsterdam, 1979 Philadelphia), Godowsky Gardens of Buitenzorg (1983, Milan), Weinberger-Chasins, Schwanda the Bagpiper (1944), Strauss II-Godowsky, Fledermaus (1973, Cologne), Mozart-Liszt, Don Juan (1975), and one of the final performances he gave of the Tannhauser overture, (16 April 1989, New York City). Gramophone July 2015 describes the set thus: 'Bolet emerges in performances which are like the blaze of Valhalla'. Jed Distler says on his website that we have here 'the pianist at his unfettered peak...[mesmerising] 'audiences with his poetic, imaginative and vividly communicative virtuosity'. Audite's survey of Bolet's Berlin recordings, 1961-1974, reaches its conclusion in January 2019 with volume 3 (Sender Freies Rundfunk) which includes on its three discs mostly material which has never been released before. A significant addition to Bolet's legacy. I will now own THREE recordings of Strauss/Godowsky “Fledermaus” by JB. Definition of luxury? A complete discography of Bolet's recordings, compiled by Farhan Malik and Michael Glover, can be found by clicking on this link. Big in Japan. 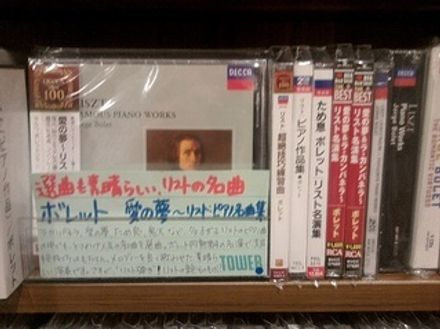 A selection of just Liszt CDs on my visit to the staggeringly huge Shibuya branch of Tower Records, Tokyo, April 2013. My favourite photograph: the LP is from 1978 and was his first for DECCA/London on their L'oiseau-lyre label. Here is a list of some of my favourite performances. This can be used as an introduction to JB's playing if you want to know where to start. They are in no special order. DECCA/ London 417 651-2. [Recorded in Walthamstow Assembly Hall, 9/1986. A gondola ride on a sumptuous swell of sound, a performance full of subtleties. [both from Piano Works Vol. 6, Decca 410 803-2 CD: recorded in Kingsway Hall, London, 10/1983]. Very moving. In his preface to this study the composer (modestly?) writes, "A most sensitive and sympathetic touch, extreme delicacy and refinement, independent and even fingers, a perfect legato, a poetic soul—all these requisites are indispensable to a proper rendering of this study." Extra recordings: his party-piece, Godowsky's waltzes on themes from Die Fledermaus, live, 1973. An absolutely stunning, no-holds-barred performance of a Godowsky etude live in 1979. I cannot resist the Rachmaninov/Paganini variations from 1978. This is a significant addition to Bolet on YouTube. One can only hope the master tape will be put on a CD. And the unusually exotic Chopin E flat waltz in Godowsky's arrangement (dedicated to Otto Pfefferkorn!) can be heard with the score to admire, too. It is described as going 'perversely Spanish' at some points! 'In person Jorge Bolet was an imposing presence. He once was described by Clavier magazine as "having swallowed deeply the spirit of Franz Liszt (and) rejoined mortals as an ambassador from the age of nocturnes and nightingales." Burt A. Folkart, Los Angeles Times, October 1990. These pages have been redeveloped and considerably extended from those of the original 2009 site, and a revised site begun Halloween, 31 October 2012.